You are here: Home / Diary / Party In the Wrong Box! Party In the Wrong Box! Have you entered the Grumpy Cat Birthday Party in a Box giveaway yet? Don’t worry — I haven’t pulled a fast one and switched the prize for a 40-lb. bag of dog food! ’Cause that is what is in this box. And for some reason, a certain April Fool named Binga thinks it is a party box! It arrived while my human’s boyfriend was out of town, and it also contained some doggie vitamins. 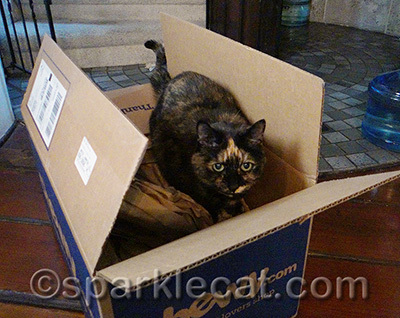 The dog had run out of the vitamins, so my human needed to open the box — and Binga invited herself in. Then, once she was there she refused to leave! She was like one of those awful party guests that stays forever. She was desperate to tear into that dog food. My human was still sick at the time so she wasn’t strong enough to lug the bag of food upstairs to the back. She had to get rid of that party crasher somehow. The only way she could end this tortie party was to eject Binga and then tape the box shut. Maybe she needs to call the cops. 😉 Silly Binga!! she shure lookz happy to bee in da pawty box!! We iz glad yer Hu’Mum cuud get her out; it looked like she waz gonna take up reeseedence in it!!! 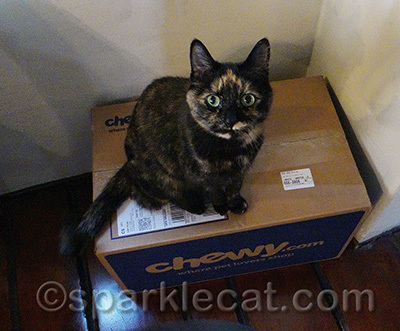 I think Binga was torn over her box addiction AND the possibility of treats addiction, not being able to stop herself! Perhaps she needs an intervention? We still have a box, in fact a box from Chewy.com out in the sun room. Annie and Eddie’s favorite hangout. Claiming squatters rights – I like it! Well, we are sure there is no such thing as a “wrong box”. Oh Binga, you sure know how to cause a ruckus, don’t you? If the cops are called, maybe “Officer Wally” will show up…he’s kind of cute! HAH! Binga was a squatter. Sheâ€™s a cute squatter. 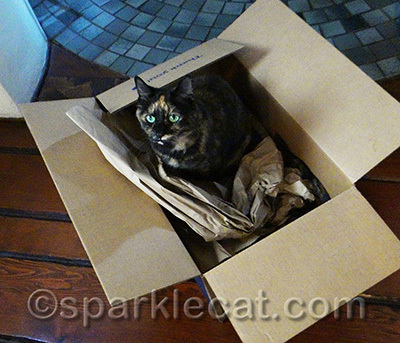 Binga, that seems rather rude to me that your human taped your box shut. 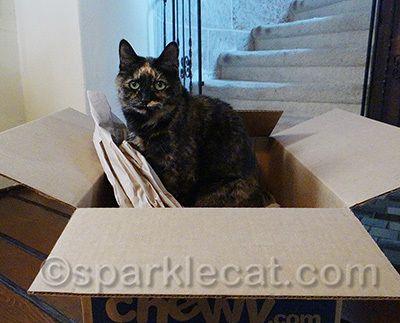 Any box that says Chewy on the side is a great place to party, even if it does have dog supplies in it. I’s ripped open dog food bags before – it are tasty! Maybe Binga was onto something, did you ask? Our human really really adores Binga. She thinks she’s simply adorable. Aww she really wanted that box. Tortitude is hard to deal with especially when you are sick 😉 Go Binga!! Such a nice box too. I would be very upset to get evicted from it. Oh BINGA! Sweetheart! That was so VERY wrong of your mommy! That box and its contents are YOURS! Poor Binga! How come she had to get ejected from the party box? Sheesh! Sparkle, they don’t call it tortitude for nothing! When a cat claims a box, it belongs to the cat forever and ever. Period. That looks like a darn good party box to me! Binga, your expressions are just adorable, especially in the second photo..we think you liked posing with the party box! We think that Binga looks very cute in that last photo! Ejected from the party box huh? MOL MOL MOL Binga I say when you find a good box with extra paper NEVER EVER GIVE IT UP! I hope your hooman’s feeling better soon, Sparkle! Binga, that is such a good looking box and dog food too. What could be better, well maybe cat treats. We don’t blame you for doing a sit-in in the box. Hope the Mom is still feeling better. Take care and have a good day. Mrs Peabody CANNOT stay out of boxes. She is also a tortie. Maybe we missed something about the tortie gene? Sorry, Binga. Party’s over. Humans are SO MEAN. – Crepes. HAHAHAHA! Tessie is the box girl in our house, too. Must be a Tortie thing. I think my kitties can understand Binga’s box obsession.. MOL Hope your mom is feeling better! Why do the parents always end the fun? 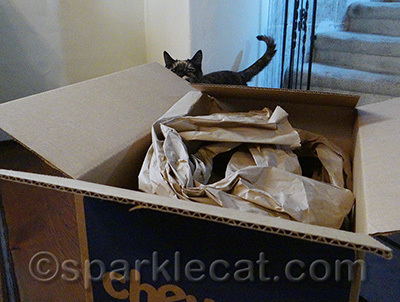 Binga, we don’t blame you for wanting to party in that box. It’s a great one! Well, it IS a great box. How can you dare to try to get a cat out of such a nice box !! Who can resist a box?!? Binga’s just purr-forming quality control in inspecting the dog food! We aren’t bothered what’s in a parcel but like Binga we do love a good box. We love dog food but someone has to take it out of the bag first. We guess Binga purrfurs DIY.